The National Alliance on Mental Illness (NAMI) is honoring Mental Illness Awareness month. During this month, we aim to learn more about mental illness, how to recognize it, and how to treat it. Just how common is mental illness? Is it impacting your life in some way? The statistics are staggering. 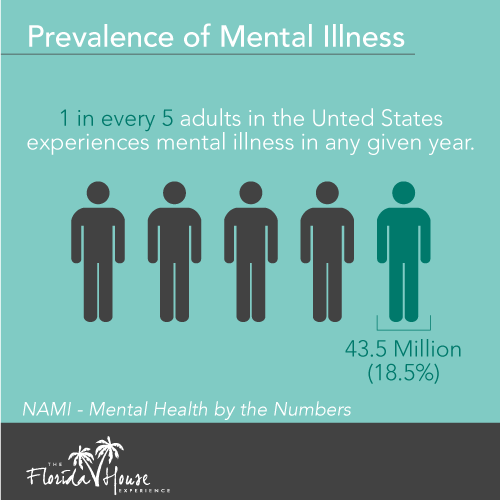 According to NAMI, 1 in every 5 adults in the United States experiences mental illness in any given year. This amounts to 43.5 million people or 18.5 percent of the U.S. population. Not all mental illness is the same, though. The same organization states that 1 in 25 adults in the U.S. suffers from a serious mental illness in any given year. That is about 9.8 million people or about 4 percent of the U.S. population. In these individuals, their mental illness creates some type of major impact or interference in their life. Many feel limited by their mental health. The teenage population is also at risk for mental illness. Often, the rate of teen mental illness concerns is underestimated. Many never receive treatment for their condition because it is not diagnosed properly early enough. Still, NAMI reports that 1 in 5 children age 13 to 18 suffers from severe mental health disorder at some point in their lives. For those who are 8 to 15, this number is 13 percent. Mental Illness – Is It A Problem? Is mental illness truly a problem? These numbers show just how common the condition is, but treatment is not often sought. And, this creates long-term concerns for all involved. Mental health does not receive proper treatment in many situations. Consider that an estimated 26 percent of those who are homeless in the U.S. living in shelters have a serious mental health illness. About 46 percent of them have a substance use disorder along with a mental illness. Or, you could look at the 70 percent of teens in the juvenile justice system today who have at least one mental health condition. About 20 percent of these individuals have a serious mental illness. The consequences of a lack of treatment for mental health extend beyond just caring for individuals. In fact, NAMI reports that seniors’ mental illnesses cost the country as a whole, $193.2 billion in lost earnings every single year. Across the country, suicide is the second leading cause of death among those aged 15 to 24 and the 10th leading cause in U.S. adults overall. About 90 percent – nearly all – children who commit suicide have some type of mental health condition – and yet many of them never are diagnosed with it. These individuals pay the ultimate price from a lack of care. It is also estimated that only 41 percent of the people in the country who have a mental health condition get the help they need. About 50.6 percent of children who have a mental health condition have received treatment in the last year. As you can see, the threat of not getting care is very high. When you look at this from a human perspective, it is very hard to grasp just how many people are not getting the help they need. What Is the Difference Between Mental Illness, Disorder, and Health? It’s common for these terms to be used interchangeably, but they are in fact a bit different. Mental health often is used to discuss the health of a person – such as mental well-being. This includes your emotions, thoughts, and your feelings. Mental illness, on the other hand, is a change within the brain’s chemistry that affects the way people think or behave. A mental disorder is an underlying condition that causes this to occur. Understanding common mental illness and common mental disorders is critical to ensuring your loved one receives the care he or she needs. Take a look at some of the most common types of disorders and illnesses and how to spot them in your loved ones or even in yourself. Every mental illness has its own symptoms. However, they can impact anyone anywhere. Anxiety disorders involve a persistent and excessive amount of worry or fear over situations that are not threatening. They feel jumping, restless, and apprehensive about day to day life. Bipolar disorder can be harder to pinpoint as some people go years without any symptoms. Yet, individuals who live with this condition have manic and depressive states. They may have hallucinations or delusions. Depression, a life-threatening condition, is one in which a person is unable to move past feeling sad and hopeless. They tend to have changes in sleep and eating patterns. They lack concentration abilities and interest in things they used to love. Obsessive Compulsive Disorder occurs when an individual has intrusive and unwanted thought patterns that tend to be irrational and create excessive urges. These compulsions may involve harming others. Post-traumatic stress disorder often occurs when an individual has experienced some type of traumatic or violent event in which they feared for their life. Symptoms include replaying those events, unnatural fears, and the inability to focus. Dissociative disorders often occur after a traumatic or very stressful event. Individuals suffer from a disconnection between their identity, thoughts, or consciousness. Their memory may fade and improve. ADHD is a type of developmental disorder that can make it hard for an individual to focus or pay attention to what is happening due to an impulse to do something or move. There are many other mental illnesses. This includes autism, borderline personality disorder, psychosis, eating disorders, and schizoaffective disorder. Each one requires mental health treatment to be fully understood. Individuals may not recognize the symptoms or signs of mental illness in themselves. However, families often can spot changes in personality, actions, and awareness that can provide indications. Whether you or a loved one are suffering from mental illness, there is help available. Our team is here to offer support. We treat mental illness along with addiction (including treating those who live with both a substance abuse and a mental illness). The first step to treatment is a phone call. We use cutting-edge technology including Neurorehab to help individuals to get on the path to recovery. This includes full and proper diagnosis, and individual treatment plans to help you succeed. Don’t wait to get help. If you are struggling with mental illness, or have a loved one that is, contact us for one-on-one treatment and care.